Auris previews next Toyota Corolla? 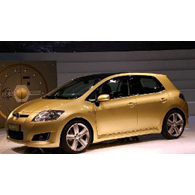 (autoinsidernews) - Toyota unveiled the Auris concept at the Paris Motor Show. Production versions of the Auris concept are expected to replace the Corolla hatch. Toyota describes the Auris as being designed from the inside out. The Auris concept is a new interpretation of Toyota's Vibrant Clarity design philosophy of Vibrant Clarity, which blends a forward-looking and energetic appearance while providing driver and passengers with a spacious and highly practical interior. o the Corolla hatch. The new name is part of Toyota's plans to reposition the small car to appeal to a younger demographic, and also to take it upmarket against the popular VW Golf. The Corolla name is expected to remain in use on the sedan versions, reports Trend.